Roaring Brook Press, 9781626729490, 32pp. 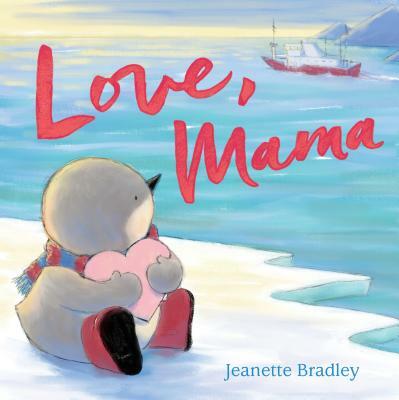 With a heartwarming story and tender illustrations, Jeanette Bradley's debut picture book Love, Mama is perfect for Valentine's Day, Mother's Day, and any day when a child needs a reminder of the strength of a mother's love. When Mama leaves her young penguin Kipling, he knows she'll return home soon—yet he still can't help but miss her. After all, Pillow Mama won't read, Picture Mama won't laugh, and Snow Mama is too cold to cuddle. And Kipling knows that no matter where Mama is, he is loved. Soon, Mama comes home, and Kipling ends the day where he belongs—right in her arms. Jeanette Bradley wrote and illustrated her first picture book at age five. Called Leopold, it featured a leopard who ate too many watermelons and developed pink spots. Later in life, Jeanette studied painting at Indiana University and Children’s Book Illustration at the Rhode Island School of Design. Along the way she also acquired a degree in urban planning. Jeanette’s exuberant illustrations have won multiple awards, including the R. Michelson Gallery Emerging Artist Award. She currently lives in Rhode Island. Jeanette is the author-illustrator of Love, Mama.